With the long-awaited arrival of baby tomato plants, I spent some time over the weekend focusing on the vegetable side of my garden which always seems to play second fiddle to my flowers. 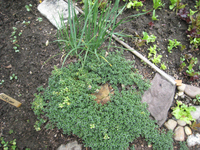 Due to a bit of hesitance to use my compost or to pay for some other amendment, I must admit that I haven't really added much to the soil this year and all the plants look hungry. I went ahead and sifted a big batch of my most finished compost, which is still not completely broken down, and took a chance using it as a top dressing for the whole vegetable bed. Though sifting removes the largest particles, I'm a little concerned that the leaf matter in particular will tie up nitrogen while it continues to decompose. However, there is lots of good humus in there and I think it's worth the risk rather than leaving everything starving for nutrients. 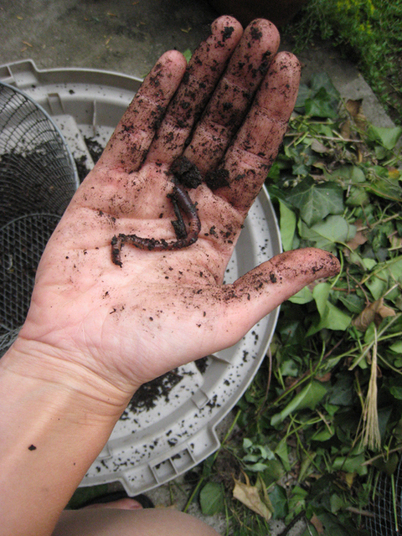 It appears I still have just the six worms I found and added to the tumbling compost bin. I was hoping that by now they would have, well, gotten to know each other and started a big family. They just need some time, I suppose. What else is going on? 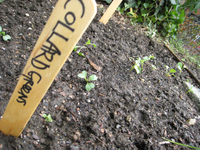 Collard greens are coming up just fine and the thyme I was wondering about seems to be ok too. 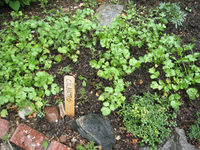 Cilantro looks more or less happy, but needs thinning. 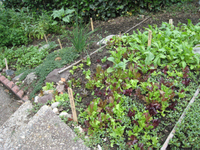 Yummy greens – especially the arugula have been providing us with wonderful salads. 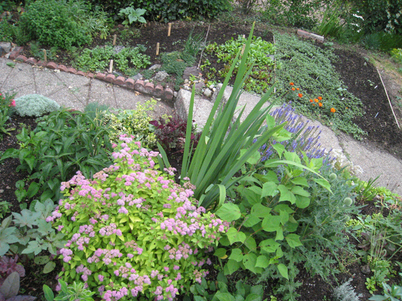 Oregano is always too monsterous while rosemary and dill along with a self-sown marigold are progressing rather slowly. We finally had a good rain just after I spread the compost so hopefully we'll see some results. Your garden is filling in nice! It's fun to watch your garden, with it being about 2 months behind mine climate-wise. 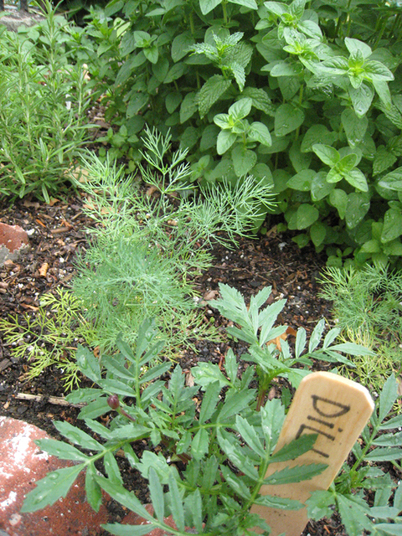 It's like I get to re-live early spring!My dill and lettuce is looong gone...so sad. Perhaps the worms can't get it on when you keep tumbling the bin?